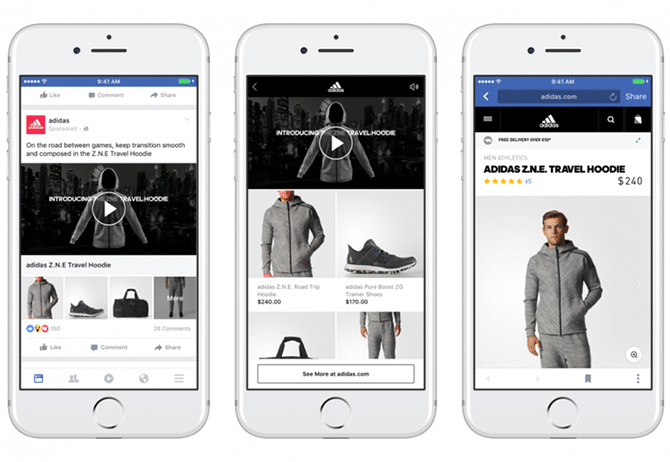 Facebook has launched Collection, a new shopping ad format that is designed to enhance buyers’ shopping experiences on mobile devices. According to the blog post by the social media giant, Collection ad format allows marketers to feature a primary video or image on top of the ad with relevant product images below it. It is designed in a way to help brands showcase products in a visually engaging way and increase the likelihood of discovery and purchase of their products. A collection is now available to all advertisers globally. The new feature is already being used by Adidas and Tommy Hilfiger to drive sales with compelling videos and product images. According to a research cited within the Facebook blog post, 45% of all the shopping journeys include a mobile action but there are high chances of drop-offs and friction due to the long loading times on the websites. Within this ad format launched by Facebook, a click on the ad would lead a person to a shopping experience within Facebook showcasing up to 50 products at a time. Whereas a click on the product would direct the interested users to either a product detail page on a business’ website or mobile app to purchase. Facebook also introduced a new click metric which would be measuring outbound links specifically measuring a number of clicks leading people off Facebook. Marketers would be able to get better insights on how people respond to the ads with a breakdown in ads reporting for ‘link clicks’ showing specific destinations such as website, app store, marketplace, phone call, message and more.